So there is this woman named Lisa Jo Baker. She is a brilliant, real, and quite funny writer. You do not have time to edit it…you just must share. And when it comes 4 days late…Ill share there too. I think I used 12. Truth be told, I had given up on the project because I knew I would not be able to post it at the right time anways. But I loved the word and had so much to share. So here are my thoughts on tree. I will share my one from last week, which I wrote in Word and saved…a little later this week. My first transatlantic voyage was to this land of dust, spice, and beauty. I was 19 and filled with Kipling’s portrayals of jungles and wild animals, Carmichael’s stories of rescue and redemption, and Abba Father’s command, thru Habakkuk the prophet, to “look at the nations, watch and be UTTERLY amazed, for I AM going to do something in them that you would not believe, EVEN if you were told”. So this little imagination was wild and free. It had grand ideas of what He was doing and what I would be doing those 12 summer weeks in dry Delhi. I imagined elephant rides with the kids from the home in front and behind me. I imagined water fights and learning the language. But I can tell you that my imagination did not imagine 89% of my summer to be spent underneath a tree. After a brief encounter with appendicitis and an emergency appendectomy 3 days after arriving in India, I realized that I had NO control over what the summer would hold. I thought I knew the Father, and to a degree I did. But I did not know the texture of His garments nor the scent of His skin. I had not sat beneath the shade of His tree. I had repented beneath it. I had been forgiven at it. I had been given salvation beneath it. But I had not just sat beneath it. Never had I rested in its shade. Rest? That sounded time consuming and surely not adventurous. That held adventure and newness, surely. Well, except that He redefined my sense of adventure. And He taught me to value time according to eternity, rather than hours and days. It was a hot summer, and the water did not come regularly. (This was the same summer of THIS STORY I shared earlier). So minutes seem to stretch into hours and days. I sweated more than I could have thought was possible thru those Cooksey pores. Clean was relative and tasks were monotonous. I learned what mundane was that summer and it has never been more radiant. The children would rise at 5 am, pray, eat, and go to school. School was held on the property. Classes were taught within those 4 rooms that held at times, near 300 children. Then after class was over, I would feel a hand slip into mine and lead me out from underneath the shade of the building, into the beating afternoon sun, and under the tree would we go. 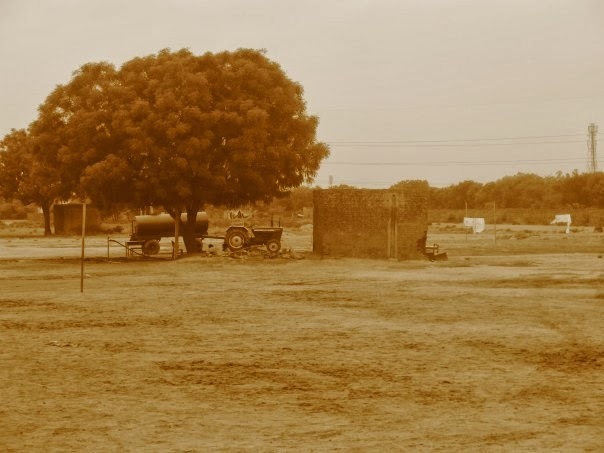 That one tree at the plot of land that held refreshment for those 300 children. They would hang from its branches, climb into its leafy layers, and sit and share their stories. I heard stories that made me sing songs of thanksgiving. I saw that there is a God who is the Father to the fatherless. I realized that, as Habakkuk said, He is doing things in the nations that we would not believe, even if told. Why would I not believe them? Because they were not exactly happening in ways I would like. This God of paradoxes was giving me pictures of His heart thru little children that had been trafficked, orphaned, or abandoned. Many were from families whom poverty left without an option, but to drop of their child in a place far away where an education was possible. I saw His hands, pierced, holding each of them. I saw His blood, holy red, washing them new. I saw His water, Living, baptizing them in an old water tank. I saw that He had never left them nor forsake them. It was beneath that tree that the big picture started to be unveiled to my teenage mind. Beneath a tree of foreboding fruit. It was at the root of a tree that sadness entered our world. But He did not keep me in that desperation long. Because then I remembered the Tree on which He bled, and hung, and died. I remembered that He restored broken things. Then I saw broken children meeting HIM beneath an old tree standing strong in a desert in India. I saw that He did not leave us without Hope. Though a tree is where despair started. A tree is where despair ended. And a tree is where I learned to smell the scent of His skin. I learned that He is never far and that He is always with the brokenhearted. Because He binds up their wounds. Now, 7-8 years later, I think of the words of Ezekiel. I think of that prophecy speaking of the Glory to come, in eternity, when He will wipe every tear from their eyes. I think of the River that is spoken of in that Glory Land, and how it flows from the Temple. It all started in at a tree. And He met our brokenness and took our infirmities on a tree. And He is meeting orphans and a young, privileged American girl beneath a tree in India. And He will heal nations by the leaves of the Tree of Life. He will never forsake His own. He showed us on a Tree.